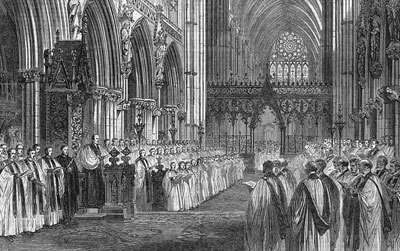 Lent 2016 sees an exciting new #LentQuiz which involves cathedrals, abbeys, minsters and Royal Peculiars throughout England which have choral foundations. The area of a church in which its choir sings is usually called the Choir or the Quire and although they are generally configured in a similar manner, their appearance and decoration differ and there are some wonderful examples of architecture up and down the country. For each of the forty days of Lent 2016 (which runs from Wednesday 10 February to Saturday 26 March and excludes Sundays) a picture of the Quire (or an area thereof) of an English cathedral, abbey, minster or Royal Peculiar will be published here at midnight and accessed via the relevant link below, or via tweets and posts on our Facebook page sent out as reminders during the course of the day. To enter, people simply have to identify which place of worship is featured in the picture. Entries will be accepted during the 24 hours after the publication of each day's image at midnight. Obviously, Lent only has 40 days, and there are 44 English cathedrals; there are four which will not be represented. The previous days' images will remain accessible through the links below, but entries will not be accepted more than 24 hours after the image is published. Within each 24 hour period, people can enter as many times as they like, but only their final answer will be accepted. There will be daily winners selected at random from the correct answers, and an overall winner with the highest number of correct answers; if there is a tie, the overall winner will be selected at random. Both daily winners and the overall winner will be named on Easter Day and the overall winner will win a year's free membership of the Friends of Cathedral Music and can be found, along with the answers, here.